Let me just get the obvious out of the way: this is no proper Southern cornbread. Please, do not bring it to a North Carolina or Texas barbecue dinner, they’ll be horrified by the presence of sugar and honestly, at that point, it may be in your best interest to not even bring up the goat cheese within. And while we’re on the subject of proper Southern cornbread — no sugar, cooked in a skillet that has often been swirled with bacon drippings — you know, I have tried to find love for it many times. I made a batch in January that all of my Southern friends (and their visiting parents) heartily approved of. It had crisp edges. It went great with the barbecue dinner. It was a cinch to make. But I didn’t like it at all and that was when I decided to make peace with this fact: I am a Yankee, born in New Jersey, living in New York City — a damned Yankee. I like a little sugar (just a touch) in my cornbread. I like to add things that are sacrilegious south of the Mason-Dixon line. I don’t think that bacon grease is the be-all end-all of cornbread cookery. Since I’ve made peace with my predilection for Yankee cornbread, wonderful things have happened. I saw a photo of cornbread that looking like it had browned bits of onions all over the top, only to find that those bits were bacon — I persevered and added caramelized, brown-edged onions to mine and loved it. While I was being blasphemous, really at the point of Respectable Southern Cornbread no-return, I threw in some goat cheese. And it was the best cornbread I’ve ever made. It was perfect. Oh, and maybe they were just being nice but my friends ate it with their Carolina barbecue and everything. But I promised not to tell anyone. This is an incredibly moist nontraditional cornbread with a great flavor and mild sweetness. The goat cheese doesn’t particularly stand out in here, but it adds a subtle tang that we liked. The night before baking the cornbread, soak the cornmeal in the buttermilk. Cover and leave at room temperature overnight. [Though this step is optional, you might appreciate it if you use coarse cornmeal or if you often find cornbread on the gritty side.] If you don’t do this in advance, mix them in before you start the next step. The next day, prepare the onions. Heat a large saute pan to medium and coat the bottom with 1 to 2 tablespoons of oil, butter or a combination thereof. 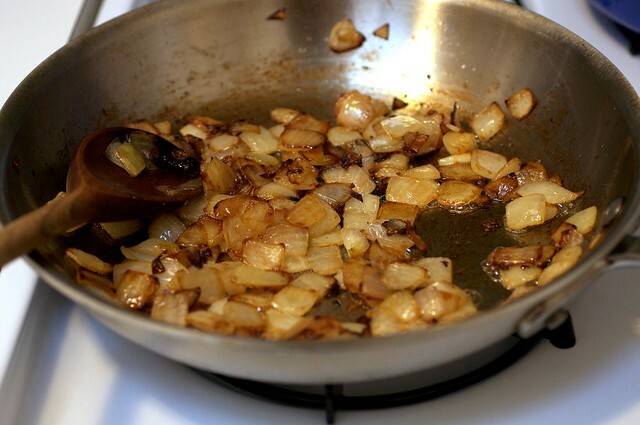 Add the onions and cook them until they’re well-caramelized with browned edges. Season with salt and set aside. In a large mixing bowl, beat the goat cheese until fluffy. Add the eggs, one at a time and scraping down the bowl between each. (It may look a little curdly at this point, don’t worry. It all comes back together in the oven.) Add the melted butter, honey, sugar and cornmeal/buttermilk mixture and mix until smooth. Add the flour mixture and stir until combined and then gently stir in the corn kernels, mixing them until the ingredients are evenly distributed. Place two tablespoons of bacon fat, vegetable oil or butter in a 10 inch round cake pan (you can also use a cast-iron skillet, 9 by 13-inch baking pan or a 12-inch square pan). Place the pan in the oven for 5 to 7 minutes, until the fat gets very hot. With good pot holders, remove the pan and tilt it to grease the corners and sides. Pour in the batter, spreading it evenly and sprinkle the caramelized onion evenly over the top. Bake for about 30 minutes, or until the cornbread is firm and springing (the baking time will depend on the size and type of pan) and a toothpick inserted into the center comes out clean. Allow the bread to cool in the pan for at least 15 minutes before slicing it into squares or wedges. Serve immediately. I’m from the South and I have to say that I would have no problem making this cornbread!! In fact, I believe that cornbread needs to be livened up a bit – all too often it is tasteless and dry so adding thigns to it is a good thing in my book! I love all cornbread!!! My work makes a spicy pimento cheese corn bread to go with the soups and I work below the mason dixon in a highly regarded golf club. This sounds really wonderful Deb. It’s hard to go wrong with carmelized onions and goat cheese! What would you recommend serving it with? I’m trying to imagine pairing it with a main course but barbeque doesn’t seem quite right. the south can keep their damn cornbread- I want this kind!! Looks amazing. I am going to try this one with as many local ingredients as I can, maybe some home made goat cheese too. Thanks for the great recipes! This looks delicious. Sometimes you just have to bastardize traditional cuisine… I am in the process of making an indian food pizza from leftovers that I made for an indian banquet. It happens. I am also doing some research in mexican cooking and this recipe made me think of something. Maybe in some way you can incorporate cajeta – a mexican goat milk caramel – into the recipe. It would be tex-mex at best. You could replace some of the sugar with this caramel and really shove it to that mason dison line. I am going to use cajeta for my trully trashy choco-flan dish (think chocolate cake topped with flan), but it would be marvelous with the sweet and savory that you ahve going on here! I’m 100% with you; I can’t stand “traditional” non-sweet cornbread. Of course, this might have something to do with the fact that I only consumed it once and that same evening became ill with a stomach bug and became reacquainted with said cornbread repeatedly against my will and now the thought of cornbread makes me queasy and even a little dizzy… But that’s gross, so I won’t tell you that. I thoroughly enjoy being a Yankee and all the quirks that come with it. I was born in New Jersey and I am now living in Tallahassee. I named my dog Jersey just to spite everyone around here calling me a damn yankee. Caramelized onions and goat cheese? What are you, from California or something? Funny timing! I’m making cornbread to take to a chili potluck tomorrow. I’m making one batch plain, and another batch with corn and green chiles. Your recipe looks delicious, although I could taste this with focaccia rather than cornbread. From Upstate NY to England (AF Base) via Texas…so my taste buds are all mixed up!!! OK, my above comment sounds as if 1) I didn’t even read the post and 2) I’m being a total cow about it. It was supposed to be funny. Like “What’s even worse to a dyed in the wool Southerner than a Yankee? One of those crazy Californians.” Which I am proud to be a member of. When I started college (in Connecticut) my roommmate asked me if I added yogurt and sprouts to everything. The only way this Georgia girl can eat traditional southern cornbread is (1) hot out of the oven smothered with butter or (2) as the base for my grandmother’s cornbread dressing on Thanksgiving. My new favorite stand by recipe is a box of Jiffy Mix cornbread mixed as directed plus 1 cup of mayo (the original recipe calls for Duke’s but I just use Hellman’s), one can of niblet corn and one can of green chilies. This recipe actually came from the doyenne of the food “scene” in my hometown. Via a Jr. League cookbook. Doesn’t get much more southern than that. I think she would approve of your recipe, Deb. As an 8th generation Texan (yes, my ancestors fought for Texas Independence from Mexico), this sounds fabulous!! I can’t wait to try this recipe, and I would be thrilled if a guest brought this to my barbeque. But then, I always put sugar in my cornbread. Texans have always been a slightly different breed. I just wanted to let you know that you are fabulous! I have yet to be disappointed in a recipe I’ve tried from your blog. Please, please keep up the great posts as I’m hopelessly addicted now! I’m from Arkansas and grew up eating cornbread just like what you have in your cast iron skillet. I like it with beans, greens, soup, a glass of “sweet milk” and… molasses. While it may be sacrilege to put sugar “in” it, I always got away with putting sugar “on” it. There was also a cornbread related exception for Jiffy muffins, which were referred to specifically as “Jiffy muffins”— clearly to distinguish them from “legit” cornbread. Call them what you want, they are sweet cornbread. Period. MMMMMMMMM, that sacrilegious cornbread looks BOMB! We love little additions in bread that make it a party in the mouth. And goat cheese is one of those ’nuff said things. For some reason I can’t see any of your pictures today. :( This sounds so good though that I’m going to be printing it out anyway! Oh wait… the first one now shows up – YUM!!! Au contraire…Southern cornbread can certainly be sweet. My favorite ever cornbread is the Crystallized Ginger Cornbread from the Tupelo Honey Cafe in Asheville, NC. Oh, this looks lovely and flavourful. I appreciate the tip about soaking the cornmeal in advance, since I often do find the texture of cornmeal a bit gritty. Looks lovely–can’t wait to try it. Years ago I belonged to a 4H club here in Canada and we learned to make “Johnny Cake” which is a slightly sweetened corn bread, but does not include corn kernels. When it comes hot out of the oven, we poured maple syrup all over it. Yum!!! My son still wants me to make this for him whenever they come for dinner. I am not sure the goat cheese will go with maple syrup, but really, maple syrup can go anything! This looks amazing. I am a Yank too. This looks fantastic. While I don’t dislike regular cornbread, I just find most versions to be so damn dry. And really, what isn’t helped by caramelized onions? I’m a Southern girl and while I don’t like my cornbread sweet, I also don’t care for the dry, yellow cornbread that so many people serve. I think this recipe sounds great. When I make cornbread I use Martha White Buttermilk Cornbread MIX and follow the directions on the package, instead of milk I substitute WHOLE FAT Buttermilk. It produces a tender, moist cornbread that is great (and would be good with sugar added if that’s what you like)! Too bad I live in Durham, North Carolina. I made grits the other day for a potluck, and they were good, but boy, did I get told that no true Southerner would go putting onions, peppers, and the like their grits. Guess I’ve got some more southernizing to do, still. I’m a Yankee too… but I also don’t like sugar in my cornbread. But goat cheese & caramelized onions??!!! Sign me up!!! I’m a born and raised Texan and I like sweet corn bread but that could be because my parents are born and raised New Yorkers. ;) This sounds heavenly but I could put caramelized onions and goat cheese on just about anything and be very happy. I need to get some buttermilk and try this out. Seems like this would hit my cornbread pregnancy craving smack on the head! Have you seen Crescent Dragonwagon’s cookbook called The Cornbread Gospels? It’s lots of fun. That sounds AWESOME! I love when combinations you wouldn’t normally think go well together are thought up and they sound like the best invention ever. I need to make this right away. My southern grandmother would probably get the vapors at the suggestion that cornbread can be made without bacon fat. Of course, she was still talking about the War of Northern Aggression at the time of her death years ago. But I truly believe that she would have liked this version too and I am definitely going to try it. We sometimes add green chilis, corn and cheddar to ours and it is great. Bradley – the only thing you add to grits other than butter, salt and pepper is cheese! Anything else, to a true southerner (which I’m not) pegs you as coming from the Godless North. I think this looks amazing, and I have all the ingredients to make it right now! (I never have buttermilk, but I just made the choc/whiskey cupcakes, so I have some leftover) One question – when do you add the cornmeal/buttermilk mixture to the batter? I’ve read it five times now, so feel free to chastize me if I missed something (I did, after all, just eat a bozzy cupcake!). Ginger — Whoops. Will fix. 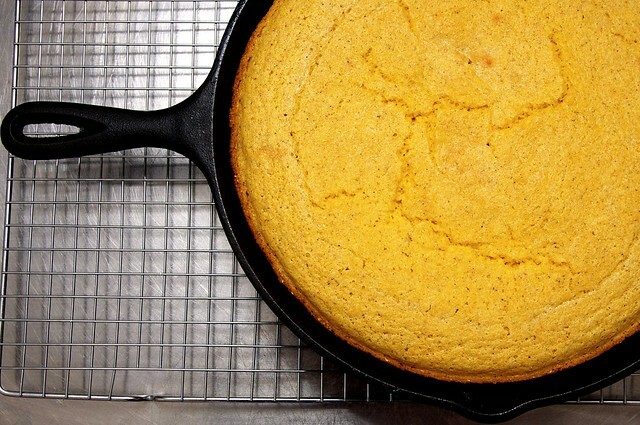 I’m glad to see you bake your cornbread in a cast iron skillet, there really is no other way is there. I’ve found myself baking my muffins all in one batch in it as well, perfect texture for me, we simply slice and toast – MMMMM. I am a crazy, tomato growing, catty Southern Woman and I am salivating. I intend to make this for my Yankee husband ASAP. I’ve made cornbread with blueberries before, and it was really good. Please don’t tell Grandmere! There is no such thing as bad Cornbread. Well, maybe that’s a stretch, but I think some are good and some are better. You can do just about anything to it and it’ll appeal to a lot of people regardless of what side of the mason-dixon line they were raised. Sweet or plain, buttermilk or regular milk, whatever the fat, or multitude of additions, still you can recognize that it’s cornbread. The preferences will still be firm, and the opinions will be hashed out through full mouths spewing crumbs, but it will be eaten til it’s gone! Frankly, I like mine a little gritty and with a touch of sugar but I’d eat this just as happily! I just made caramelized onion and goat cheese pizza a few nights ago. Such a great combination… your cornbread looks like one thing to add to my growing list of “must try” recipes that are piling up. I need a little sugar/honey in my cornbread too. I made the NYT Brown Butter Cornbread with Farmer Cheese and Thyme the other day, and was truly disappointed. I mean, the title reads so wonderfully. But I realized I’m a fan of unproper cornbread…sweeter and moister. That looks great, Deb, and I can totally imagine the flavor as being just a bit tangy, without a strong goat cheese flavor. And it looks so moist! It’s not that I like sweet cornbread (although I enjoy the more cake-like cornbreads out there as well), but I think cornbread without a tiny bit of sugar lacks something. The sugar rounds out the flavor, bringing out the natural sweetness of the cornmeal, I find. We used to make a fabulous cornbread at the last place I worked that included sauteed onions and jalapenos along with plenty of black pepper and fresh savory (really great flavor). And yes, it had sugar. We were making true Southern cornbread for a while and it was so awful that I used to secretly double the butter and salt in it when I had to make it. Made it much better, but still seemed boring and bland. Whoa- this is for me. I would marry goat cheese if I could! I came by from Twitter just to check out the comments. I love them. I almost always add corn kernels, and often a chopped jalapeno or two. A little sugar helps the flavors meld together. My grandmother always made it in a cast iron pan. I even have her old cornbread sticks pan, which I love. I look forward to making this version! And ditto @ Laurie re Crescent Dragonwagon’s cornbread book. Cornbread (sweetened with honey, molasses and sugar) studded with dried apricots and bacon bits – served with a scoop of homemade maple ice cream. What more could you ask for? This looks amazing, and I will put aside all cornbread prejudices to try it! That looks awesome. I’m a sucker for anything with caramelized onions, and I love a sweet cornbread. OK, I am a Texan–and am not a fan of sweet cornbread–but I can’t wait to make this recipe. My ancestors will be horrified! But it just sounds so darn good. I wonder if it would work without the honey? (OK, I can feel my ancestors rising from the grave?) My hunch would be that without the sugar (but keeping the honey), I should add a beaten egg white or two for a little heft. Hmmm. this looks great! I love the idea of adding goat cheese to cornbread! This sounds awesome! I bet it would be great with some cranberries thrown in. Thanks for the ideas Deb! i’m a proper southerner, but you better believe i’ll be making this asap! As a southerner I’ll say this: you can make whatever kind of cornbread you want and as long as it’s tasty, we’ll eat it and be happy. Just don’t ever try and call it southern. oh my GOD this looks delicious. Here’s one Southerner who won’t hold a grudge! This cornbread sounds so fabulous, totally up my alley. Not only is it gorgeous, but those flavors are oh-so delicious. What a great play on cornbread! This sounds like the ticket, as well as the cheddar pimento version mentioned earlier. Oh yeeeahh, that’s what I’m talkin’ ’bout. Anything with caramelized onions. And goat cheese. And cornbread. Well, whadda ya know…. This is right up my alley:) I am a SOUTHERN girl and I love some sugar in my cornbread. Plus, I am basically addicted to caramelized onions and goat cheese. I am going to make this for SURE. but there is really nothing better than caramelized onions. on anything. this looks good! as a kid, my mom made a lot of cornbread, and i lived in Nebraska. go figure. anyway, i’m in NC now, and still haven’t gotten into cornbread. although i do see it served with this honey-butter sometimes. so maybe not everybody is anti-sweet. but overall, i’m just not that into standard cornbread. How funny – I was just thinking about making cornbread with feta in it! I love goat cheese even more though, so I’m going to bookmark this one! I’m beyond excited to make this myself! Thankyouthankyouthankyou! Thanks for sharing! Goat cheese and caramelized onions is a new favorite flavor- I like to mix the two into a pot of pasta, with chopped tomatoes and green onions if I have them. This looks scrumptious! Just to clarify, a Yankee is anyone not from the South (as in New Jersey, Ohio, San Diego) and a damn Yankee is one who moved to the South and won’t leave. Southerners generally tend to approve of things that are homemade, so I don’t think you’d be harassed too much if you showed up with this recipe south of the M/D line. I was thinking about replacing the goat cheese with brie or ricotta and the onions with cherries or raspberries (definitely not a slight on your delicious looking recipe! Just not in a savory mood tonight). I’ve been goggling whipped brie/ricotta, hoping to see the right consistency but I’m just not sure, and it was a shot in the dark in the first place. Think it would work? (If any of you are Berkeley, CA residents, this is out of the desire to emulate the lovely Cheeseboard’s cherry and corn scones). Well, it looks like the majority prefers sweet or embellished rather than plain. This isn’t meant to be offensive but I often marvel at how many people have food “rules” and/or dislikes that carry over from childhood. My mother always insisted that we at least TRY a bite of something. While I’ll admit to not wanting to try any kind of organ meats, I have grown up to liking almost everything. It makes for a happier life…..and bigger hips !!! Anyway,the short version is…. in our home we prefer sweet or embellished cornbread too but I’ll eat it any old way I can get it. Maybe tonight I’ll try cornbread with dried cranberries and chocolate chips !!!! Looks amazing as usual – tried your other cornbread recipe the other day which worked out a treat! Now I know exactly what’s happening to the rest of the polenta. I’m a Southerner born to Yankee parents, but I have always had sweet cornbread and never heard that it was blasphemous to add sugar. I agree, the sweeter the better and this recipe looks delectable! As a carbo-holic Southerner, I think this sounds delicious! But then again, I’m a Southerner from Central Florida, and many would tell you that I don’t count as a Southerner… Boo. I’m a North Carolinian and I like some sugar in my cornbread. My mom on the other hand regards this as heresy…”we don’t talk about that”. This looks good..I will have to make it one night when it’s just the grownups. As a born n bred southerner growing up on pintos and cornbread, I must say this looks DELISH (minus the sugar). I’m making it this weekend!! I think the Yankees have it! I am sad to say the last corn bread I made was Marie Calendars… I aspire for such yummy creation. I need to get organized and use your recipe! I’m a born and bred GA girl for the first 25 years of my life and my momma always put a little sugar in her cornbread. It sounds like it’s good nobody found out or we might have been lynched! LOL I still make mine with a bit of sugar too so it must be fate that I live in CT now and my cornbread fits in. This looks fabulous! Hmm… I live in Texas and I put sugar in my cornbread, but it’s only about a tablespoon of honey or white sugar (not both). Of course I live in Austin and I’m pretty sure my family would enjoy the onions AND the goat cheese… because Austin is liberal and all. :) But I would still have to cut the sugar back. I haven’t made cornbread in years – I must do it again. Love reading your blog – you are an excellent writer. Thanks for existing in my world. Oh! This looks so good! I am also not a huge cornbread fan (being a Yankee!) but I am def going to try this version- Yummm! I think I really was from the south in another life!! I am and always have been drawn to Southern cooking!! OMG this looks so DAMN good!!! That is a lot of ingredients for cornbread! :) I’m from Alabama, and grew up on the kind made only with cornmeal, eggs, buttermilk and oil. I prefer “plain” cornbread as a general rule, but I’m pretty sure if you plopped that dish in front of me I would eat about 1/2 the pan in no time! I saw this and actually gasped and said “OHMIGAWD I AM SO MAKING THIS!” I have put the caramelized onion/goat cheese combo together with just about every carbolicious base out there, but it never occurred to me to put them together with my much-loved cornbread. I am also a sort-of-sweet cornbread-liker. To me, it’s the perfect carrier for a juicy, berry-filled fruit salad. Yum! I saw that title and picture and my mouth literally fell open. Delicious. I am feeling a cooking weekend coming on, and this is number one on my list. I am from Texas, and this looks AMAZING! I’m totally going to try this! I have always hated the typical bitter, dried out cornbread that most people around here make! Sammi – I also use honey, but to dip cornbread and hushpuppies into. Never thought about adding into the bread. Great idea. Hah you think that has sugar? I’ve been adapting Dorie Greenspan’s corniest corn muffin recipe to a whole skillet full of love, then I put picked jalepenos in it. That is probably the ultimate blasphemy. This recipe looks awesome. Thank you Deb for seeking the awesome. I’m a California girl now living in the South. I was raised on southern cornbread and like the crispy edged, crunchy cornbread my mother always made. BUT, I prefer a sweeter version with “stuff” in it. Jalapeno cheddar or the kind with creamed corn added. Heck, I’ve even had some with cranberries. This looks great and I cannot wait to give it a try. Oh, and another recommendation for The Cornbread Gospels. Wonderful collection of recipes! Stupid question but where do i find coarse polenta? This looks absolutely amazing. I believe if I brought it anywhere people would be in love with this new corn meal. Radish — It’s coarse cornmeal, aka polenta. You can find it at Whole Foods, Garden of Eden and I am sure the Italian place in Chelsea Market. I wouldn’t even be surprised if it was at Gristedes, though I can’t say I’ve looked there! Deb- when I grow up (which is ASAP hopefully, as I am not very young) I want to be you! Born and raised in the deep South, I prefer my cornbread unsweetened. BUT I really think that buttermilk is a must to get that little bit of tangy. I also add an egg to lighten it a bit. And you must, must, must completely frost the top with real butter :-) That helps it slide down. That said, I’m all for new things, and this one looks heavenly. Looks yummy. I am reading the Cornbread Gospels by Crescent Dragonwagon right now (think someone mentioned it, above!). It is a great read. And she sure was right that cornbread gets people talking. It’s not something that many Canadians seem to care about. I may have to do some evangelizing! Sigh! I miss real cornbread. I miss bacon drippings making my bottom (of the cornbread) crusty. Sorry Deb – I may live up here in Yankee territory, but when it comes to cornbread, I’m a Tennessee girl. I think I need to make a big pot of soup beans and cornbread now. On the other hand, I do love goat cheese and onions & I’d be willing to leave the sugar out….. This has sent me on a quest for those wonderful cast iron cornstick pans that made cornbread so scrumptious that no manner of culinary creativity (or sugar) could improve upon them. Unfortunately, I’m not having much luck now I live in Ireland–cornbread is an unknown here. (Wonder how overweight my suitcase would be if I tried to sneak some back on my next trip home?) Still, this looks like a winner of a recipe without the aid of the famed cornstick pan, and I look forward to trying it. This sounds great! I get bored from plain cornbread but this combo sounds fantastic. Two of my favorite ingredients are in it with the goat cheese and caramelized onions. Thanks for sharing! Being a Canadian, I can’t say much for what a real Southerner would think of this bread, but I know my mouth is watering. Almost anytime I see “caramelized onions” in the title of a recipe, I’m hooked. The goat cheese is an added bonus! Wow, this is something that would never have occurred to me but it sounds delicious! I actually adore plain cornbread, but I make it my own way and I have never found a(nother) recipe that quite re-creates the flavor I love. I think my husband would love this and appreciate a little variety! Lordy, and I thought I was the only Texan reader. So wrong! PS SMITTEN KITCHEN DOES NOT LIKE COLLARD GREENS. SOMEONE HAVE A TALK WITH THIS WOMAN. Straight from Austin, TX…I agree that regular cornbread is somewhat, ummmm…gross, dry, tasteless- pick your adjective. But, I eat it anyway because it is one of the few bready things that I can eat. Your gussied up version sounds delicious and I will definitely try it in the next few days. Thanks for the inspiration! What a great unique cornbread flavor combination! It look so moist too, a lot of them come out too dry for me. Love that buttermilk!!! Looks delicious! No, I did not read EVERY comment, but being from the Deep South, I have something to say about cornbread and that is that there is no law — anywhere, not even in Texas or the Carolinas — that says you can’t put sugar in it. The best I’ve ever tasted, and yes it is tasty, is from Paul Prudhomme’s Louisiana Kitchen cookbook. I change nothing. I never put in frou-frou ingredients but always put in the 1/3 cup sugar and 5 teaspoons of baking powder called for. People who don’t like plain cornbread simply haven’t found the right recipe. I think this is it. And absolutely nothing soaks up the juices from green or black-eyed peas quite like plain ol’ cornbread. Let me start with…I LOVE CORNBREAD!!!! Can’t wait to try the recipe. this sounds very yummy! i would love little pockets of the cheese in this, what would happen if i just put little lumps of goat cheese on top or slightly under the batter…hmmm experiment time! I made this last night, with grated cheddar instead of the goats cheese, and it was lovely. It was a bit too sweet for me, but still delicious with a salad of hot radishes and the first tiny lettuce of the season. Ok, I’ve lived in Mississippi, Alabama, Lousiana, Texas, and Florida (whew), and spent a good amount of time in Georgia and North Carolina and have eaten a fair amount of cornbread in each state. Only one or two times was the cornbread unsweetened. Judging by the above comments, most southerners posting add some sweetener to their cornbread, too. So now I’m wondering, where did the idea come from that “real, Southern cornbread” doesn’t have any sugar in it? Hmmm….. Anyway, can’t wait to try this version–sounds heavenly. Great recipe…give a really nice touch to the cornbread. Thanks for sharing it! I think I had a Deb siting at the Orangette reading last night, but I was too shy to ask. Was it you?! I’m also a Yankee and will visiting the South for the first time in a couple months– I wonder what they’ll say if I bring up your delicious cornbread recipe. “the goat cheese was to die for!” hee hee. I love sugary cornbread.And southern cornbread I have tried has been quite sweet. I have never made any cornbread I have liked. But, I do love it…made by others. This seems as good a time as any to admit I’ve been trying to convert my Southern husband to Yankee cornbread without telling him. I am gradually adding more and more sugar when I made it because the dry stuff he calls cornbread is so not my favorite. I think we’ve hit our middle ground– he called it a little sweet but really good, and it was sweet enough for me, so we won. Next time, mm, goat cheese. I was at the Orangette reading last night. I don’t bite! My first question besides the sugar thing, would be, how CAKEY is this cornbread? Because that is the other factor. The texture of true southern cornbread can not be cakey (and sweet) like so many horrifying NYC coffeeshop yankee corn muffins are. You’ve got to have that cornmeal texture coming through. I think I will chance making this…but you KNOW I’m going to be adding bacon. Oh gosh, don’t even talk to me about the trouble with Southern Cornbread! We live in KY, where EVERYONE makes cornbread without sugar, as few eggs as possible, and it is dry, dry, dry. Only thing it is good for is crumbling over the top of their over-exalted soup beans. Believe me when I say I have to try not to choke on their cornbread (if one can call it that) when I eat it. Whereas my family puts in three eggs, lots of butter and sugar, and cornbread ends up more cake-y in texture. It’s delicious hot and fresh with some butter and honey and is a good foil to an extra spicy chili– but none of my friends understand what it means to have cornbread with sugar in it. Mmm, yum This sounds great, I love goats cheese and caramelized onions. I’m looking forward to trying this! a cup = 6 oz of cornmeal? am i missing something? isn’t a cup usually 8 oz? Alex — Not following. Different ingredients have different weights. A cup of water is 8 ounces, but that is liquid. Merceb, the park maintenance guys I worked with in south Georgia called me a damned Yankee–as in “damned Yankees–always sneakin’ up on you”–even though I only worked a nine-month season. They still ate the chili and the skillet pineapple upside-down cake, though. Even though it’s starting to get warm here, I’ve been yearning for home-made not-so-sweet Yankee-style baked beans, and I think this Yankified cornbread would be a perfect accompaniment. I too have struggled with cornbread that’s too sticky (sweet) or gritty (savory), even when the flavor’s right. I suspect the slight creaminess and tang of the goat cheese would be just the ticket for me. Thanks for this recipe! Just tried it–though I used some roasted red pepper, chopped, instead of the corn and added some parsley, too. It was amazing! I’d say it *smells* cakey, but tastes more like cornbread. And my whole house smells like caramelized onions, which always makes me happy. 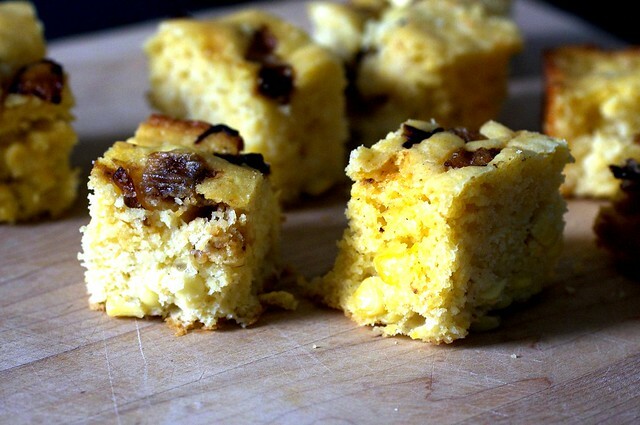 And I don’t usually like the corn kernels in cornbread, but this REALLY works. I’m a Texan who likes sweet cornbread, too! YUM! This was totally awesome, even though I made a million mistakes! (I chronicled this recipe’s foolproof-ness on my blog.) Thanks for posting it! Chiming in again in my own obnoxious way. I made something like this cornbread…but I used my beloved imported-to-California Martha White cornmeal mix, and yes, I added crumbled bacon. But it was delicious, especially with pieces sliced open, toasted, and topped with poached eggs! I made this for dinner tonight and I must say, it is the moistest, most delicious cornbread I have ever eaten. The addition of buttermilk and goat cheese is so good, and don’t even get me started on the caramelized onions. Didn’t make the cornbread tasty overly onion-y, just really yummy. Definitely try it! I love cornbread, but I’ve never used bacon drippings. I only grease my pan with Crisco shortening or with canola oil, depending on what I’m going to do in that pan. I use Crisco for cornbread, heating it on the stove, then sprinkling with cornmeal so it’ll get a nice scald on the bottom. The batter — sugar-free, yes, and often milk-free, because I use soy milk if I’m making it for a meat meal — goes in, then the whole thing into the oven. But really, I don’t make a lot of cornbread. Mostly I make Southern batter bread, which is with cornmeal, boiling water, margarine, milk/soymilk, and eggs. It’s gluten-free, and it’s way more moist than normal cornbread. Makes a great dressing (which, for the uninitiated, is like stuffing, but it is NOT shoved up a bird’s cavity, and should ONLY be made with cornbread or batter bread, NEVER with regular bread, which creates a goopy, gluey mess). Cornbread with caramelized onions– amazing! I would like to point out that bacon and all that renders forth are, in fact, the be all end all. That said. I found this more cakey than normal cornbread and the goat cheese did not add the nip I thought it would. It sort of got lost. That said – the caramelized onions were really good. I did a second round with a lot of onions and hot peppers caramelized in bacon grease and left in the pan then the bread poured on top, then turned out like an upside down cake. It was a crunchy savory love affair. I think I’ll try a version of this (SANS sugar or honey) when I make cornbread next. But I think it needs bacon pieces in it. For those interested (or just giggling about some of the comments *looks guilty*) the ‘real Southern cornbread has no sugar’ goes back to the Civil War and the shortages then (as well as just before then). That’s also where the thing about ‘real Southern grits is grits, water, salt, and maybe butter or bacon grease’ comes from, too. Personally…even though I can’t stand sweet cornbread, I HAVE to have buttermilk and cream corn in mine (so it’s not dry)…and I like having onions and other things in both my cornbread and my grits. *gets down off the soapbox* Anyway, just a few tidbits for anyone interested. And what’s this about not liking collard greens? How have you had them fixed? Thank you, thank you, thank you for your statement about what makes REAL cornbread. I am southern born and bred and, though I love food from, well, everywhere (but please don’t boil my vegetables) cornbread and sweet tea are the two things where there can be no compromise. Iron skillet, bacon grease, the closest sugar should be is in the tea and lots of fresh butter on the hot cornbread. Love your site, the recipes and photography. We are having the yummy Grilled Eggplant with Caponata Salsa for dinner tonight to try to pretend like it is warm and spring here rather than 50 and raining. this looks so tasty! goat cheese is amazing has that extra aroma and taste that makes food so special. YUM! Made this this weekend and it was delicious. It feeds a crowd but I could have used another one as people were looking to take leftovers home! Made it in 2 stages (my dining room is open to the kitchen so I like to have a lot prepared in advance, especially floury stuff): I put the wet ingredients and the dry together but kept them separate until I was ready to bake. As always, fantastic recipe. This was very good. The texture was really nice; soaking the cornmeal in the buttermilk was a fantastic tip and will keep in mind for the future. I found that the goat’s cheese didn’t really add anything to it. I could faintly taste it the day after when the cornbread was cold. I think it definitely needs some spicing up! Next time, I will throw in some chili flakes and maybe use a different cheese than goat’s. The onion topping was amazing and I sprinkled a generous amount of sea salt on top to balance out the overall sweetness and add some top crunch. The next day, I warmed up the pieces in a toaster oven which made all the cut sides toasty – now that was amazing! Outstanding! After a looong slow caramelization the quantity of the onions seemed too puny to produce a sufficient sprinkling on top so I ended up mixing them in at the end, which made the whole thing just lovely. I did cut the fat a little overall, probably by about 1 1/2 tablespoons, and used a little less sugar, and it was still yummers. And my altitude adjustments worked! I felt very proud to have finally made a perfectly likable cornbread. I think this was a little too unusual for my coworkers; I had to open it up to practically the whole floor of our building before they disappeared. Those who liked it loved it; others didn’t comment. There was a tangy aftertaste from either the buttermilk or the goat cheese that I loved, so perhaps it was that plus the strong oniony-ness that put people off. Ruby, if I wanted more spice I’d probably chop some fresh hot peppers, saute them with the onions at the end of the saute, and sprinkle them on top. I made this tonight, and while it was delicious, I suggest giving a size to the cast iron pan. I made it in mine, which is a 10″, and it was really full, the butter boiled over the sides, and my oven lit on fire. Also, because it was so tall, it took forever to bake. Followup–I made a half-batch last week in a 9×9 pyrex pan. The result lacked a little in crispiness but toasted up very, very nicely. I also made a few changes: didn’t caramelize the onions to the smoky intensity of the first batch, and added canned chopped green chilis for the last 10 minute or so of the saute. I mixed the saute into the batter, having decided I just liked them better that way. I also used a different chevre this time, which I believe was much milder and left no aftertaste while adding the creaminess that makes this recipe so special. Finally, due to some long workdays, my grits soaked in buttermilk for no less than four days. I think there’s a whole lot of corn bread in this displaced Yankee’s future. Made this this past weekend and really like it. I should have halved the recipe because it was a ton for 2 of us, but then again I wouldn’t have had any to bring into the office and I don’t think my coworker’s would have appreciated that! I put it in the kitchen at 9am and it was all gone by 10am. Great recipe although I wish I had a bit more of the goat cheese tanginess. Just pulled this out of the oven! I am taking it to a party tomorrow so I am hoping it tastes delicious (I am sure it will). Do you have an tips on reheating? It’s a terrible thing, to do that to a cornbread. Just call it something else and you’ll be fine. Putting sugar in it makes it johnnycake, not cornbread. Love the sound of this recipe and I’m planning on making it for Thanksgiving. The only catch is that I will need to make it this weekend — do you think it will hold up ok if I freeze it? Thanks!! I made this yesterday – and the quantity of batter was wayyyyy to much for a standard 10″ cast iron skillet. I put it in a deeper 10″ and it was great. Having said that I made two slight variations – I didn’t have enough buttermilk, so it was a mix of buttermilk, whole milk, and half and half. I’m sure that made a difference. AND of course, BACON. Now having said *that* I got two marriage proposals and a “best cornbread I’ve ever had” response. I made this tonight and it was amazing. I didn’t have a lot of goats cheese and I didn’t have time to soak the cornmeal and buttermilk (well I was impatient) and it still came out amazing…. However I noticed above in the other comments that the quantity was too much for a 10 inch pan, I had the same issue and I had to bake it for an hour…I suggest splitting the batter into 2 pans if anything. Anyways I follow this blog a lot, it’s one of my favourites, thank you so much, I look forward to each post! A pretty belated comment, but I only just got around to making this after having it on my lengthy list of “to cook recipes”. Its delicious – I misread the recipe and mixed the onions in to the batter but that seems to work (and also didn’t have quite enough goats cheese). I’ll definitely be making it again! Its a lot moister than the Gourmet recipe I have been making and thus I’m hoping the leftovers may even be edible tomorrow (with aforementioned recipe the cornbread is nice fresh out of the oven but very dry a few hours later). I made this yesterday and we really loved the flavor profile, although I think I could have added even more than 2 cups onions. Also, I am a Southerner and only use White Lily Flour because many old Southern/family recipes simply won’t work with any other brand of flour. Something about the gluten, or proteins, or something. Anyway, it’s much finer than other flours, yet I still sifted it. I just thought I’d add that I think it would have been better not to sift it and simply mix in the baking powder, baking soda, and salt. My guess is that with another flour, you might want to sift, but I felt like it was too fine after sifted. So, just a suggestion for anyone else in the South who might be using White Lily! We thought this was a great recipe though! I made this two days ago to accompany a chicken with mushroom/wine sauce dinner for my husband and me. While there’s ample chicken and sauce leftover, there isn’t a crumb of cornbread left. It is beyond delicious. Thinking I might be sharing it with our young grandsons who are picky about eating anything they’re not familiar with, I mixed the caramelized onions into the batter to disguise them. After his first bite, my husband urged me to reconsider and not mention the cornbread to the boys. I doubled the amount of caramelized onions and was very pleased with the results. Thanks for a delicious cornbread recipe! I love this recipe, and recently realized that it would be a wonderful resting place for excess CSA corn that I haven’t used yet! Suggestion for your recipes page–this and your corn muffins would make lovely additions to the corn section. Just had to share that first :) I made this cornbread for a chili party I had last weekend and it was THE BEST cornbread I have ever had. You are right about the goat cheese not standing out (maybe it contributes to the amazingly moist texture) so I think next time I may throw in some sharp cheddar as well. Anyway, delicious! Thank you!! I would highly recommend this recipe to anyone who likes a slightly sweeter cornbread. Really moist and smooth textured. Made as directed apart from using honey and vanilla flavoured goat cheese (had it in the house), thinning sour cream with milk to a buttermilk consistency, and baked for 35 minutes in a 9 by 13 pan. I did increase the oven temperature to 375 for about 10 minutes in the middle of the baking time as I wasn’t sure the temp was high enough, but then turned it back to 325. Also, I used regular cornmeal and only had time to soak in milk/sour cream for about 1 hour. Thank you, Deb, this was lovely and so is your cooking site. Thank you for this recipe. I made it along with the Black Bean soup and it was delicious. I didn’t realize I only had 4 ounces of goat cheese, but it turned out well. I really thought it fantastic the next day when it was room temperature and slightly firmer than when warm. I did not find it sweet at all; thus, I am left wondering what traditional corn bread tastes like if this IS sweet. This was delicious, but how could you go wrong with carmelized onions and goat cheese? I only had a 4 oz log of goat cheese and thought the mild flavor was perfect. I loved the onions and would definitely increase the amount next time. I liked how some onions stayed on top and others sunk into the batter while cooking. I cooked it in a 9×13 pan and it needed closer to 40 mins cooking time. It was still super moist and made me wonder if I could have baked it a few minutes longer. Will definitely make this again, but halve the recipe because its a lot of cornbread for two of us. I really really really wanted to like this. We had cornbread all the time when I was a kid even though I’m from New England and not the south. I didn’t love it. I think I’m just a Jiffy box mix with half the sugar kind of girl. Tried this recipe recently and used boursin cheese in place of the goat cheese and also added a little shredded smoked cheddar as well. It was really tasty, however I think my cast iron skillet was a touch too small. The mix filled the pan and as a result, took about an hour to cook and was still a little too moist in the middle. Overall, I think it could be an awesome recipe with the right skillet!! I have to admit – I did not make this recipe to the full extent of it’s possibilities. :) I really just wanted a good basic cornbread (and SK is my standby source) so used this recipe without all the fancy extras. It was delish! I used 2 cups cornmeal/polenta mix, and only 3/4 cup white flour. I used 1 cup milk and 1 cup of Trader Joe’s “European style” plain yogurt in place of the buttermilk. I included the corn kernels, used only 1/4 cup brown sugar as sweetening and kept all the baking soda/powder, salt, eggs and butter as written. It worked great baking it in the cast iron skillet – with such a superior crispy bottom/edge. Thanks Deb for another winner! Love it! As a fellow Yankee but transplant to the deep south, I am delighted to find a non-cardboard cornbread recipe. This recipe also makes me smile because we have dairy goats and make the cheese that this recipe calls for. A good friend sent me the link to this site, and she must have known what my cold-blooded Yankee taste buds long for! Thanks for sharing! I’ve had bad luck with baking cornbread in the past, but always secretly loved it. We don’t do dairy, so at the risk of sounding like a bad epicurious comment, I left out the goat cheese and swapped the buttermilk with soy-milk + lemon juice and it was still among the best cornbread of had. Certainly the best i’ve ever made. My go-to cornbread! Gets tons of compliments/second helpings when I take it places. I add a little bit of cayenne. This looks delicious! I see the recipe says to serve immediately. Would it work to make this a day ahead? I’m thinking about making it Wednesday night to take to a Thanksgiving dinner on Thursday. Thanks! I echo Andrea’s question. Would it be OK to cook, to bring to a Thanksgiving dinner, then warm up there–or better to serve it at room temperature? I think this would be fine to bake in advance and rewarm when you get where you’re going. We just had a cooking competition at my office, and I won the second category with this delicious cornbread! Everyone was over the moon for it. Deb definitely grabbed some new fans today. deb this looks fab! i have pepper jack and fresh corn on hand. i would like to sub shredded pepper jack for the goat cheese. how much pepper jack cheese should i add? can i just omit the goat cheese or do i need to add back more liquid ingredients to balance the batter? I haven’t tried it with shredded cheese but I think it will work just fine. I would add more buttermilk to replace the goat cheese and use as much cheese you think seems right. It should be flexible. Hi Deb, “melted butter” is spelt incorrectly in the list of ingredients. Hi Edlyn — Sorry, but I don’t see where! Am I missing something? I made this cornbread the other night and love the taste / the look / the ingredients list. One question: at the end, when swirling the 2 Tbs. of bacon fat/veg. oil/butter to coat the pan, am I then supposed to dump the remainder out? I did not, and noticed that it pooled up into the corners and sides, which, unfortunately, resulted in a very strong (and not very nice) vegetable oil flavor permeating all of the lovely crispy browned edges! Maybe it’s better with bacon fat or butter? At any rate, I am disappointed with my oily, bitter edges and thought maybe I had been too literal in my recipe reading. Hi Hillary — It sounds like your vegetable oil was turned, or past its prime. (Not to insult your pantry, of course, but vegetable oil is supposed to be neutral and shouldn’t taste bitter or flavored.) Butter and bacon fat of course have a more delicious flavor, but a neutral one should work inoffensively here. Made this last night and it was so delicious! Didn’t tell husband and kids about the goat until after they ate it. There was a lot of braying going on after dinner! Thanks for all your wonderful recipes. Hi Deb! Do you think these will do just as well as mini muffins? Not all southerners like their cornbread dry and crumbley. My southern bell of a mother always served our family sweet cake like cornbread and extra-sweet iced tea, but then again she has a monstrous sweet tooth. I am thinking of taking a couple of pans of it to Easter dinner and am wondering, have you tried any other cheeses than goat? Deb (or other readers! ), I have a question.. I’m making variations of this recipe for work tomorrow, and I’m planning to make two versions: one with goat/walnuts/dried cranberries, and the other plain, with cheddar (to accompany chili). My question is: How integral is the goat cheese to the bread’s texture? Do you think swapping it for cream cheese might work just as well? I’m only asking because I have tonnnnnns of cream cheese but a limited supply of goat cheese, so I’d rather “goat” up the walnut/cran version and get by on cream cheese in the cheddar version, if possible. Any thoughts? Lisa — Cream cheese should be just fine. I made this for thanksgiving yesterday and it was a BIG hit! Everyone was asking how I achieved such an awesome texture. Really great recipe!! Hi, I was wondering if I could make this as muffins, and if so, what would you recommend for the cooking time? It sounds absolutely delicious! I think you could, though I haven’t testing out the baking time, usually corn muffins bake for between 15 to 18 minutes. Check in a minute or two before, to be safe. Made this tonight. Wow so yummy! Used a whole onion. Very moist delicious cornbread. I like using an instantaneous thermometer and it took almost 40 minutes in my new oven to get the bread to about 198 deg F. Husband loved it. Went great with our meal of chicken with green olives and roasted Brussels sprouts. Considering this for Thanksgiving to satisfy the inevitable “I’m hungry but that danged bird is still in the oven” period. I’m thinking Vidalia. I made this for Thanksgiving exactly as written and it was delicious. I had to use 9×13 pans because my iron skillets were in use. Thought baking time would be shorter in the sheet pans, but not so. Don’t forget to switch racks in the middle of cooking if you’re baking two at the same time. The top rack was done in 30 minute but the bottom rack was still raw. Worked out for me — the first batch had been devoured by the time the second batch was baked and rested. Love cornbread but can’t eat corn. Can I leave out the corn kernels? This is the only cornbread I will ever make! Thanks a lot Deb. I love that this is your own recipe and Th story behind it. I’m bringing this to a gathering, I’m sure it will be devoured in no time. – I used a very finely ground cornmeal, almost like flour – so I skipped the soaking step… Just mixed the wet and dry in two bowls. Like a cake! – I didn’t use goat cheese and made my own buttermilk (450 grams) with vinegar and milk. Also, all the fat I used was ghee (or clarified butter). – Had to caramelize a lot more onions because it’s delicious! I used a mandoline… I put the caramelized onions into the batter because I wasn’t using any corn kernels. – I baked it in two pans that would nicely fit together on my baking rack (20 cm square and 20×30 cm rectangular) and tried to portion it by the “eyeballing method” hehe… They were done in 25 minutes. – I crumbled some feta on top. I made this recipe last Thanksgiving, pretty much as written. I will say, the first day that I did not really taste the goat cheese in the cornbread that I ate. However, the next day it was definitely noticeable. I’m not sure if it was just because there were so many other “competing” flavors from Thanksgiving, or I just didn’t really mix the goat cheese that well in the batter. I decided to make the cornbread again this year, but without the onions and goat cheese (mostly due to the fact that I wasn’t sure how many of the 2016 T-Day guests liked caramelized onions & goat cheese). I didn’t have any buttermilk, but I did have a 12 ounce can of evaporated milk (the remaining liquid was whole milk). I substituted the goat cheese with cream cheese. Everything else I left the same. I really wasn’t sure if the bread was going to turn out too sweet without the buttermilk and goat cheese; I figured if that it did, it would wind up being a version of breakfast corn muffins. I will say that the cornbread came out sooo good! I was actually surprised at how “popular” the cornbread wound up being at dinner. I really didn’t have much to take home as leftovers. FYI this is the first time I’ve had this type of instance with your directions… I added the full tsp of salt to the onions – rather than simply seasoning the onions with salt and sifting the 1 tsp of salt in with the flour, baking soda, baking powder. Made this for a work potluck. It was a big hit! Thanks for the awesome recipe. This cornbread has become a staple for celebratory gatherings. So yummy and moist. My keto neighbor, (with whom I shared a some- since I was concerned I’d eat it all), stated he was willing to break his diet to enjoy this.